Clinical factors that affect the likelihood of abuse in children with femur fractures have not been well elucidated. Consequently, specifying which children with femur fractures warrant an abuse evaluation is difficult. Therefore the purpose of this study is to estimate the proportion of femur fractures in young children attributable to abuse and to identify demographic, injury and presentation characteristics that affect the probability that femur fractures are secondary to abuse. We conducted a systematic review of published articles written in English between January 1990 and July 2013 on femur fracture etiology in children less than or equal to 5 years old based on searches in PubMed/MEDLINE and CINAHL databases. Data extraction was based on pre-defined data elements and included study quality indicators. A meta-analysis was not performed due to study population heterogeneity. Across the 24 studies reviewed, there were a total of 10,717 children less than or equal to 60 months old with femur fractures. Among children less than 12 months old with all types of femur fractures, investigators found abuse rates ranging from 16.7% to 35.2%. Among children 12 months old or greater with femur fractures, abuse rates were lower: from 1.5% - 6.0%. In multiple studies, age less than 12 months, non-ambulatory status, a suspicious history, and the presence of additional injuries were associated with findings of abuse. Diaphyseal fractures were associated with a lower abuse incidence in multiple studies. Fracture side and spiral fracture type, however, were not associated with abuse. Studies commonly find a high proportion of abuse among children less than 12 months old with femur fractures. The reported trauma history, physical examination findings and radiologic results must be examined for characteristics that increase or decrease the likelihood of abuse determination. Femur fractures are the most common orthopedic injury for which children are hospitalized in the United States [1, 2]. Although the majority of childhood femur fractures result from accidental trauma, abuse is also a common cause of these fractures, especially in children less than 1 year old. Thus, medical providers caring for children with femur fractures should recognize and evaluate children who might be abuse victims. Abuse evaluation and diagnosis rates among children with femur fractures have, however, been noted to vary among hospitals and providers [3–6]. Furthermore, studies have shown that failing to recognize and evaluate for abuse in young children with fractures can result in children suffering complications from additional undiagnosed injuries as well as ongoing abuse . Although femur fractures have been associated, in general, with a high abuse risk in young children, [8–10] the prevalence of abuse in children with different types of femur fractures has not been established. Moreover, other clinical features that increase or decrease the likelihood of abuse determination in children with femur fractures have not been well elucidated. This uncertainty regarding which children with femur fractures might have been abused may contribute to variation in care and missed opportunities to diagnose abuse in the pediatric population. Given these uncertainties, we systematically reviewed published studies in order to: 1) provide estimates of abuse prevalence among children ≤5 years old with femur fractures and 2) describe the association of specific clinical features with likelihood of abuse determination. Recognizing that the vast majority of abusive fractures occur in the infants and young toddlers, we included children up to age 5 years in our review as abusive fractures have been occasionally reported in preschool age children [10–13]. Due to the heterogeneity of study populations, we did not perform a meta-analysis. Instead, we present the proportions of children diagnosed with abuse in each study as well as details of the study population, in order to provide a richer understanding of the prevalence of abuse in different sub-populations of children with femur fractures. 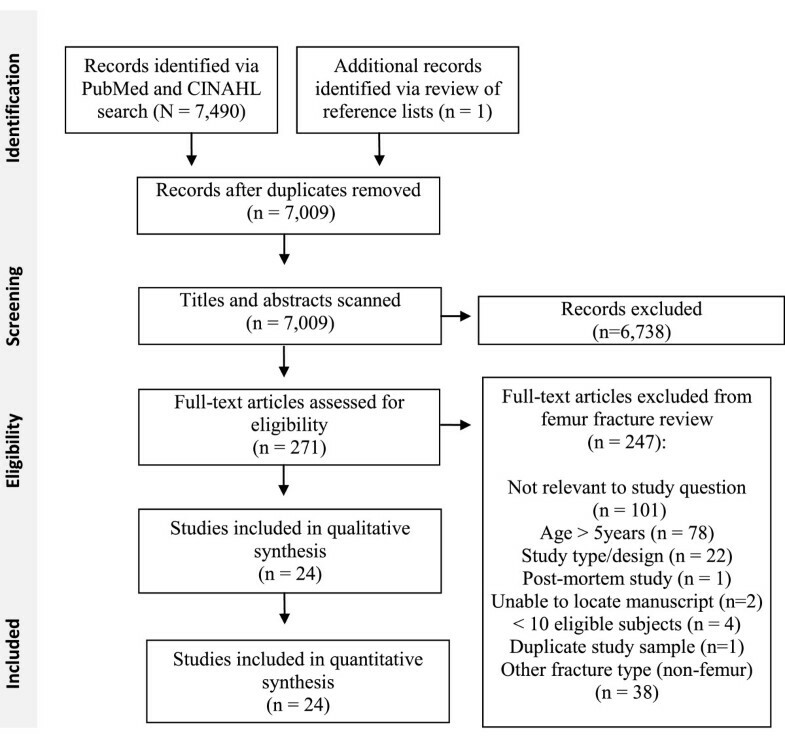 A systematic review of the literature on abuse in children with fractures was performed using a pre-specified protocol with inclusion criteria (available upon request). This paper covers the subset of articles specific to femur fractures (Figure 1). We performed searches for studies published in English between January 1990 and July 2013 in the PubMed/MEDLINE and CINAHL databases using the search terms listed in Additional file 1. We included terms related to both abuse and accidental trauma to avoid bias toward studies focused exclusively on abuse. Studies were also identified by iteratively reviewing reference lists of articles identified during the search. Processes of study identification, screening, eligibility assessment and inclusion. Randomized controlled trials (RCT), prospective non-RCT studies, and retrospective data analyses were included; surveys, reviews, editorials, case series and textbooks were excluded. Studies were included if subjects were ≤5 years old or if the data for the subset of children ≤5 years old could be extracted. Studies including fewer than 10 children ≤ 5 years old with femur fractures were excluded, as were animal and post-mortem studies. Methodologically weak studies due to significant bias in selection of subjects, such as studies including only cases seen by the investigator for medical-legal review or studies including only the subset of patients who were eligible for a specific treatment modality, were excluded. Titles and abstracts of studies were screened by one of four reviewers (JW, OF, Maria Fatima de Reyes, VM), and non-relevant studies were eliminated (Figure 1). Full manuscripts for relevant studies were assessed for eligibility by two reviewers (JW and OF or VM) in an unblinded standardized manner, with disagreements resolved by consensus. Two reviewers (JW, OF) independently extracted the following information from the studies using a standardized form: 1) study population characteristics (ages, type(s) of fractures, study location and dates), 2) inclusion and exclusion criteria for subjects, 3) potential biases, and 4) number of fractures attributed to abuse and accidental mechanisms in overall study population as well as within study subpopulations. The reviewers assessed the level of the evidence presented in each study using the 2011 Oxford Centre for Evidence-Based Medicine (CEBM) Levels of Evidence table (Table 1). Per the CEBM Evidence Levels, articles providing the strongest evidence are likely to be assessed as a level 1, and those providing the weakest evidence are likely to be assessed as a level 5 [14, 15]. The CEBM Evidence Levels for “How common is the problem” were applied to studies of the prevalence of abuse in children with femur fractures. The CEBM Evidence Levels for diagnosis studies were adapted for assessing studies examining the association of specific clinical features with likelihood of abuse determination. Studies providing information on both questions were assigned a single score based on the question for which they had the weakest level of evidence. The level of evidence assigned to a study is specific to the level of evidence for answering the questions posed in this review and may not be reflective of the overall quality of the study. For example, the level of evidence was downgraded for studies with small numbersof children with femur fractures although the studies may have had appropriate methods and large study populations that included children with other types of fractures. Similarly, studies were classified as non-current and received a lower level if any of the data was from prior to 2000. Finally, the CEBM Evidence Levels for prevalence studies include assessment of whether the study population is local or not, but we chose to eliminate this factor as we were not attempting to estimate the prevalence of abuse in a particular location. Instead we provide the location of each study and leave it to the reader to determine the applicability of the study data to their population of interest. For each study, the reviewers also rated the methodology used to determine that an injury was due to abuse using a scale adapted from Maguire et al. which assigned the highest rank (1) to studies requiring that abuse be either confirmed at a child abuse case conference or civil or criminal court proceedings, or admitted by a perpetrator, or witnessed. The lowest rank (5) was accorded to studies providing no stated criteria for categorizing cases as suspected abuse (Table 2). Reviewers resolved disagreements through discussion and consensus. How common is physical abuse? Is this factor associated with risk of physical abuse? *Adapted from the 2011 Oxford CEBM Evidence Levels of Evidence table . Level may be graded down on the basis of study quality, imprecision, indirectness, or because the absolute effect size is very small. Current was defined as data from 2000 or later. *Adapted from a scale with 5 levels developed by Maguire et al. (2005). For studies using specific stated case based criteria to make a determination of abuse (rating 3), we distinguished studies that included only definite abuse cases (3a) from those that also included likely or probable abuse cases (3b). Assessment by multidisciplinary hospital-based child protection team as part of routine clinical care did not qualify as multidisciplinary assessment. #Level 4 includes studies relying on ICD-9 and E-codes for identifying abuse cases in administrative data sets and studies relying on diagnoses of abuse made by clinical teams without providing specific criteria by which these diagnoses were made. The abuse prevalence for each study was calculated with 95% confidence intervals (CIs) from the data reported in cohort and cross-sectional studies. The study-specific sensitivity, specificity, positive likelihood and negative likelihood ratios with 95% CIs of different clinical characteristics for abuse were also computed. Formulae described by Simel et al. were applied to calculate 95% CIs for likelihood ratios. All other analyses were performed using Stata 12 (StataCorp, College Station, TX). The Preferred Reporting Items for Systematic Reviews and Meta-Analyses (PRISMA) checklist was utilized in reporting the results of the systematic review (Additional file 2). The comprehensive literature search identified 7,009 non-duplicate citations on all fractures, of which 271 were deemed relevant. Twenty-four studies on femur fractures met inclusion criteria (Figure 1). [2, 4–6, 10, 18–36] A total of 10,717 children of ages 0–5 with femur fractures were examined in the 24 studies. Two studies using a national database [10, 19] received a study methodology quality rating of L1, 1 study  received a rating of L2, 3 studies [2, 20, 24] received a rating of L5, and the remainder of studies received ratings of L3 or L4 (Table 3) [4–6, 18, 21–23, 25–30, 32–36]. Three studies requiring that abuse be confirmed by case conference or court proceedings following a child protective services (CPS) investigation received a rating of 1 for the abuse determination methods [18, 22, 26]. Ten studies reported specific clinical criteria applied in diagnosing abuse (rating 2 or 3) [4, 20, 21, 24, 25, 29–31, 33, 36]. Eleven studies, including 8 studies relying on administrative data, received abuse determination ratings of 4 or 5 [2, 5, 6, 10, 19, 23, 27, 28, 32, 34, 35]. aPresents overall study methodology ranking (L1-L5) and abuse determination methodology ranking (1–5). See Table 1 for description of the ranking scales. Some studies utilized multiple different methods to define cases of abuse or suspected abuse and therefore received more than one ranking. bPatients with other injuries (in addition to the femur fracture) were excluded from these studies but the exact definition of additional injuries varied. cThe data presented are for the relevant subset of a larger study population which may have included children with other types of injuries, other ages, and/or from other time periods. The inclusion and exclusion criteria applied in subject selection varied among the 24 studies, with differences in the types of femur fractures and possible etiologies considered. Only 5 studies included children with any femur fracture type from any etiology [10, 19, 21, 27, 36]. Thirteen studies excluded children with pathologic fractures and/or children with a clear accidental etiology such as motor vehicle crash (MVC) [2, 5, 6, 18, 20, 22, 26, 30, 32–35]. Eight included children with specific types of fractures or specific reported trauma histories [22, 23, 25, 26, 28, 31–34]. Three studies excluded children with additional injuries, [4, 22, 26] potentially biasing the abuse prevalence lower. 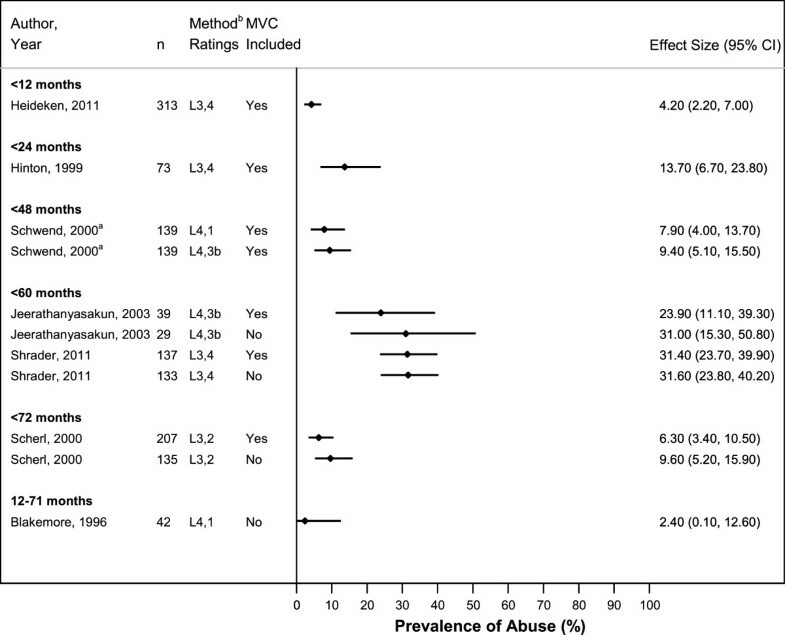 Among studies including children 0–36 months with all types of femur fractures from any reported etiology, estimated prevalence of abusive fractures ranged from 11.0%-31.2% (Figure 2) [4, 10, 21, 29, 30] Exclusion of MVC-related cases increased the range of reported abuse prevalence in the studies to 11.6%-50.0% [4, 21, 30]. 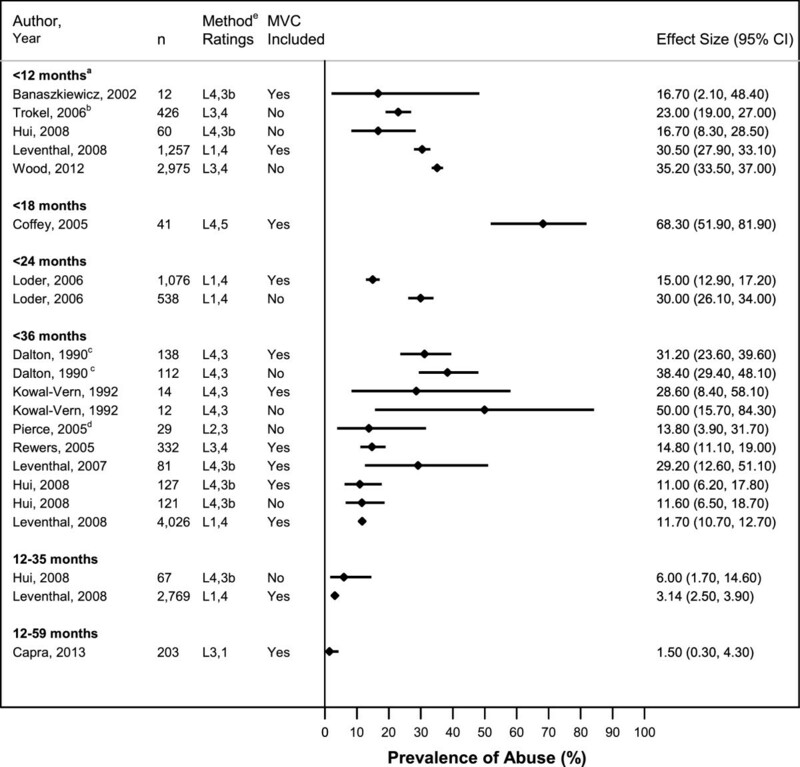 Restricting the population in these studies to children <12 months old resulted in a range of 16.7%-30.5% abuse prevalence if MVCs were included [10, 36] and 16.7%-35.2% if MVCs were excluded [5, 6, 30]. One study which included cases categorized as “child abuse suspected” in the trauma registry and which received the lowest child abuse methodology rating of 5, reported an abuse prevalence of 68.3% in children <18 months old . In a study of children ≤36 months old with a reported stair fall history, 13.8% of children with femur fractures were categorized as abused . Among children >12 months old with all types of femur fractures, abuse was diagnosed or confirmed in 1.5-6.0% of cases [10, 18, 30]. Probability of Abuse in Children with a Femur Fracture, All Types. Proportion of cases with abusive femur fractures in included studies, by subject age criteria of inclusion. aUpper age limit was 11 months in Leventhal  & Wood  and 12 months in Hui . bData for only the subset of children admitted to children’s hospitals or to general hospitals without children’s hospitals could be extracted. cStudy was limited to children with isolated femur fracture and no additional injuries. dIncluded children with reported history of stair fall ≤36 months old only. ePresents overall study methodology ranking (L1-L5) and abuse determination methodology ranking (1–5). In a single Swedish study relying on administrative data, 4.2% of children <12 months old with diaphyseal femur fractures were categorized as abused (Figure 3) . A higher abuse prevalence, 13.7%, was reported in an American study of children <24 months old, also relying on administrative data . Two studies, one American and one Thai, reported even higher rates of suspected abuse among children <60 months old with non-MVC-related diaphyseal femur fractures: 31.6% and 31.0% respectively [32, 33]. Two studies focused on children with diaphyseal femur fractures and no additional injuries reported lower prevalences of cases substantiated as abusive by Child Protective Services (CPS) in their samples (2.4% and 7.9%) [22, 26]. Probability of Abuse in Children with Diaphyseal Femur Fractures. aStudy was limited to children with isolated femur fractures without additional injuries. bPresents overall study methodology ranking (L1-L5) and abuse determination methodology ranking (1–5). In the single study of children <12 months old with a complete distal metaphyseal fracture, abuse was suspected in 75% and diagnosed in 50% of cases . Age <12 months was associated with increased abuse likelihood in 3 of 5 studies, with positive likelihood ratios ranging from 3.3-19.7 (Table 4) [10, 20, 24, 30, 32]. Another study reported increased probability of abuse among children aged <18 months, as compared to counterparts ≥18 months . Two studies examined the relationship between age in years as a continuous variable and risk of abuse: one found significant association between younger age and increased risk , but the other did not . Non-ambulatory status was associated with increased abuse likelihood in both studies examining this association [26, 30]. < 12 m.o. vs. 12 m.o.-35 m.o. < 12 m.o. vs. 12 m.o.-59 m.o. < 12 m.o. vs. 12 m.o.-71 m.o. < 18 m.o. vs. 18 m.o.-47 m.o. aComputed using two-sided Fisher’s exact test. P-values of 0.05 or less were considered statistically significant and are presented in bold text. b P-value reported in Hui  paper was 0.037 but calculated to be 0.09 using two-sided Fisher’s exact test. Male gender and Medicaid/uninsured status were each associated with increased likelihood of abuse likelihood in only one [2, 32] of several studies examining these associations [22, 26, 28, 30, 35]. No association was found between abuse likelihood and race [26, 35]. In a single study, lower scores on the Hollingshead Occupational Scale (HOS) for fathers, but not mothers, were associated with reports to CPS . A suspicious history was associated with abusive femur fracture in 3 of 3 studies (Table 5) [2, 22, 30]. The definition of suspicious history varied but generally included history of no trauma, an unwitnessed trauma history, or a history considered inconsistent with the injury. Delay in care of >24 hours and unknown trauma mechanism were associated with abuse, while a trauma history witnessed by a non-parent was associated with non-abusive femur fracture [22, 30, 32]. In one study, injuries occurring at home or an unknown location were associated with abuse compared to injuries occurring in public places . b P-value reported in Pierce  was 0.055 but computed as 0.010 using two-sided Fisher’s exact test. cDefinition of suspicious history generally included no known history of trauma, or a history of trauma that was unwitnessed or considered inconsistent with the injury. dPublic place included locations categorized as public, recreation, and street. eCurrent polytrauma was defined as another concurrent long bone, clavicle, axial fracture, or other body system injury that would require hospitalization. Additional injuries, including bruises, other fractures identified on skeletal survey, and subdural hemorrhages, were significantly associated with determination of abusive femur fracture in 3 of 4 studies (Table 5 )[2, 30–32]. Universal screening for additional injuries was, however, not performed in any of these studies. In 2 of 3 studies, diaphyseal fractures were associated with decreased abuse likelihood, compared to other fracture types (Table 6) [2, 30, 35]. Distal diaphyseal fractures, in comparison with proximal and midshaft diaphyseal fractures, were associated with abuse in another study . In one report, distal metaphyseal fractures showed increased abuse probability , but this finding was not replicated in a second study . Fracture side, spiral fracture type, or bilateral fractures did not show significant association with abuse [22, 26, 28, 30]. Our review identified 24 studies providing information about prevalence of abuse among young children with femur fractures. The confirmed or suspected abuse prevalence varied widely across the studies with point estimates ranging from 1.5% - 68.3%, reflecting the heterogeneity of the studies’ populations and methodologies. The structure of this review, focusing on smaller groups of studies with similar populations and stricter child abuse determination methods, produced narrower ranges of abuse proportions. Our results indicate that there is substantial risk of abuse (16.7%- 35.5%) in children <12 months old with non-MVC-related femur fractures. The abuse prevalence in this age group was lower, however, than the 50.1% (95% CI, 34.1-66.1) reported for children <18 months in a recent meta-analysis by Maguire et al.,  likely due to differences in search strategy and inclusion criteria. We included accidental trauma as well as abusive trauma search terms to prevent bias towards studies focused on abusive fractures alone. In addition, we limited our search to articles published in 1990 or later, while Maguire et al. included earlier papers. Although the shorter time frame for our review may have excluded relevant papers, we included only papers published after 1990 for two important reasons. First, data suggest that the abuse probability among children with fractures has changed over time . Second, the subject matter is explored mostly in retrospective studies which depend upon clinical evaluation practices that may have changed over time. Child abuse is a relatively new field; many pediatric centers did not establish child abuse programs until after 1990 . Finally, our estimates for prevalence of abusive femur fractures included data from cohort and cross-sectional studies, while Maguire et al. also extrapolated from case–control studies. Although the two reviews provide different point estimates, both found a high prevalence of abuse in children <12 months old with femur fractures. The results of this review also emphasize the significance of reported history and the presence of additional injuries for abuse determination in young children with femur fractures. Femur fracture type and position were, in general, not significantly associated with abuse, with the exception that diaphyseal fractures and mid/proximal diaphyseal fractures particularly might be associated with decreased abuse likelihood. On the other hand, distal metaphyseal femur fractures may indicate increased likelihood of abuse. This review has three principal limitations. First, the studies were mostly retrospective in design and not all subjects were assessed consistently for clinical findings, potentially contributing to detection bias. Second, as there is no clear gold standard for diagnosing child abuse, there is concern for circular reasoning in the identification of factors associated with increased risk of abuse. Third, influence of the abuse determination method on abuse prevalence estimates was evident: studies employing more stringent criteria for making a determination of abuse reported lower abuse rates than studies with less stringent criteria. This observation is highlighted in a study where 38% of cases were reported to CPS for suspected abuse, but only 2% were confirmed secondary to abuse at court hearings . Another key concern lies in the potential differences across physicians in calibration of their determinations of abuse [38, 39]. As a result, the variability of findings of abuse might reflect the spectrum of criteria for those determinations, rather than an underlying variation in the prevalence of abuse if all studies applied the same criteria for determining abusive fractures. The results of this review underscore the need for prospective studies of children with femur fractures to allow for more accurate estimation of abuse risk in this population. In such studies, standardized evaluation and data collection procedures would be utilized to minimize detection bias and circular reasoning. Lacking a gold standard method for determining abuse, these ideal studies would report whether abuse was diagnosed using specific stated case criteria, as well as whether abuse was confirmed by CPS or court proceedings. This comprehensive literature review underscores the high prevalence of abuse among children <12 months old with femur fractures. In addition, non-ambulatory status, a suspicious history, and the presence of additional injuries were associated with increased likelihood of abusive femur fracture in multiple studies. No significant association was found between probability of determination of abuse and the following characteristics: fracture side; spiral fracture type; bilateral fractures. Additional prospective studies are needed to further elucidate the characteristics that affect abuse probability in children with femur fractures. We would like to acknowledge Maria de Fatima Reyes for her assistance with identification and screening of abstracts of studies obtained from search databases. This review was funded in part by grant 1K23HD071967-01from the National Institute of Child Health and Human Development (NICHD). Dr. Joanne Wood’s institution has received payment for expert witness court testimony that Dr. Wood has provided in cases of suspected child abuse. JW conceived of the systematic review and participated in design of the review, development of the search strategy, screening and assessment of articles, data abstraction, statistical analysis and manuscript drafting. OF participated in design of the review, development of the search strategy, screening and assessment of articles, data abstraction, statistical analysis, and manuscript drafting. VM participated in design of the review, screening and assessment of articles and manuscript editing. RL participated in design of the review, statistical analysis and manuscript editing. CF and DR participated in design of the review and manuscript editing. All authors read and approved the final manuscript.